Lesley Batchelor, Director General of the Institute of Export, and Kevin Shakespeare, Head of Education at the Institute of Export, explain this method of payment in international trade which you might consider for a large transaction. A bank guarantee of payment is usually issued by the overseas buyer’s bank, issued in favour of the beneficiary (you the exporter), guaranteeing that they will pay you the quoted sum of money, providing you meet the terms and conditions quoted in the letter of credit. These conditions require that you present the quoted documents in the letter of credit ‘on time and in order’. The documents required are usually those that the overseas buyer requires in order to meet quality assurance, and documents required by the Customs authorities of the buyer’s country. in strict accordance with the terms and conditions set out in the letter of credit – that’s exactly not just more or less right! be presented at a specified place. Why might I use or need letters of credit? Letters of credit are another way of managing risk. They can offer a guarantee to the seller that they will be paid, and the buyer can be sure that no payment will be made until they receive the goods. Laws and regulations – does the country you’re exporting to require a letter of credit? Costs – does the value of the order justify the cost of a letter of credit, and who will pay these costs? The customer’s creditworthiness – do they have a track record with you? Risks associated with the country you’re exporting to – is it politically stable or are there extra risks at the moment? Normal trading practices – is it standard practice for exporters to use letters of credit when trading with that country, and/or in that particular commodity? Available guidance – banks may recommend using of a letter of credit in certain trading situations regardless of other factors, while credit insurers sometimes insist on it. Give some thought to alternative arrangements, such as insurance, factoring or cash in advance terms. 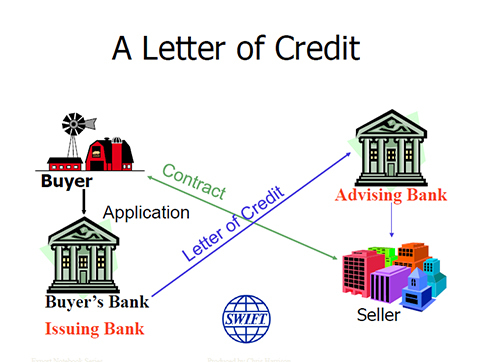 What are the advantages of letters of credit? Guaranteed payment upon presentation of correct documents. This guarantee is provided by the buyer’s bank. In some cases the buyer’s country may not allow payment due to currency restrictions. If you have concerns about this happening please contact your bank to ask them to add their ‘Confirmation to a Letter of Credit’. Confirmation is where your bank adds their guarantee for a fee. Do you and your buyer understand how letters of credit operate? Are you able to deliver the order – the right quality, quantity and on time? What payment terms have you discussed? Will any specific requirements be allowed, for example, transhipment, partial shipment? Do you/your staff know the customer you/they are dealing with? Have credit checks been undertaken? Is the buyer experienced in dealing with letters of credit, and experienced in the documentary requirements in their country? This is very important. Can the goods be shipped on the required dates? There are costs associated with letters of credit. Has it been agreed between you and the buyer who will pay these costs? Open to Export also has a handy guide to letters of credit charges. The Guarantee comes from the Issuing Bank (the buyer’s bank) and only comes from your bank if you ask for Confirmation to be added. Make sure that you can do all the steps that the customer and their bank has asked of you in terms of packing, documentation and shipping – this should be done by reviewing a draft of the letter of credit before it is issued’. Next brief your shipping agents about the letter of credit giving them a copy. Make sure your staff are aware of the detail that must be used in operating with this banking product and ensure they have the training to do this. greatly reduces propensity for error. What if I need to amend my letter of credit? If there are any errors or if it turns out that you as the seller are unable to meet the agreed terms, then an amendment will be necessary. Always attend to these as soon as possible. If agreement is reached an amendment to the letter of credit will be received by you, the seller. Letters of credit are great but be warned – very few are right the first time because the supplier (that’s you) often misread them or don’t produce the correct documents to support the letter of credit. If the documents are not compliant it is unlikely that you will get paid under the letter of credit. You can also find out more about letters of credit at the HMRC web site.